Well, hello there! Glad you stopped by. I'll bet you were wondering when I was going to start posting about my favorite holiday. Today's the day, my friend. Ever since I was born, I have received ornaments from family members. (I believe one or two of them owned Hallmark stores when I was younger, and therefore the Hallmark ornaments became a gift tradition.) For my first Christmas in 1980, Grandma Bob sent me the first ornament in a new series that was beginning that year--a little pink Victorian house. It fit in the palm of my hand, and if you turned it over, the backside was open just like a dollhouse, and you could see the little furniture and Christmas decorations. Obviously in 1980 I didn't care much about receiving this ornament. But over the next decade, I loved playing with these little house ornaments and I always looked forward to seeing what the next one in the series would look like. A library, a fire station, a candy shoppe...all with little green Christmas trees decorating their interiors. As I grew older, Grandma kept asking if I still wanted to receive the ornaments as my Christmas gift. When I was 21, she even wrote me a note and told me she had expected the series to end by then and she'd be more than happy to send me something else if I wished. 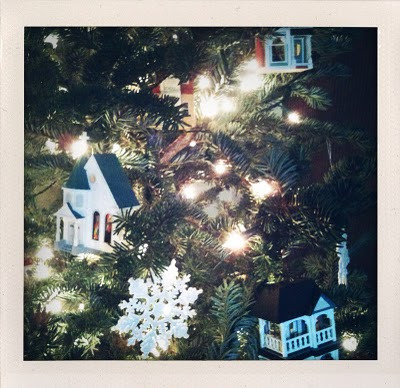 But those little house ornaments were still my favorite, and I kept requesting them. Every year when my family put up the tree and the boxes of ornaments were brought down from the attic, I looked forward to seeing those sentimental relics of my childhood. Grandma Bob passed away the day Nick and I got engaged, in October 2005. That Christmas, the new house ornament was still there waiting to be unwrapped. My mother picked up the tradition, and I still receive the ornaments as a gift. Miss Piggy dressed as an angel was given to me as a child, and she still has the same heavenly smell of vanilla as she did the day I opened her box for the first time. 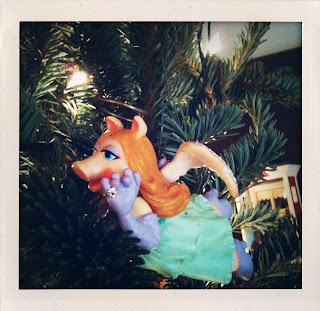 I was a big Miss Piggy fan as a child (obscure fact), and I always insisted on giving her the best spot on the tree--front and center. My younger brother Cody had a matching Kermit the Frog (who was dressed up with skis and a toboggan), and we played the "Hallelujah Chorus" on the record player every year as we placed them together on the tree. I'm weird. I know.